Wine must to shipped, no in store orders. "Offers fresh spearmint overtones to the chocolate-laced plum and black cherry flavors. Features fleshy tannins and plenty of gusto on the finish. Drink now through 2026. 18,000 cases made. –MW"
Thorn-Clarke Wines was launched in 2002 as a result of the 37 year marriage between David and Cheryl Clarke (nee Thorn). The Thorn family have grown vines in the Barossa since the 1870’s and still proudly own and manage some of the oldest vineyards in the region. The wine is another reward for geologist David Clarke and his family. The family has planted four diverse Barossa vineyards over the last 20 years, enabling them to blend wines grown from different terroirs which adds complexity and richness to the wine. Outstanding parcels of 100% Barossa Valley fruit are selected from the Kabininge vineyard for these wines which then receive special oak maturation treatment in our Barossa cellars. 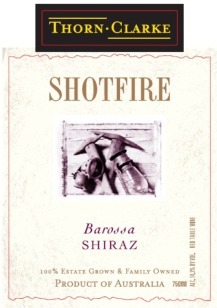 The result is a rich and voluptuous Barossa Shiraz and an exciting Cuvée. Vinification techniques: crushing and de-stemming into open fermenters. Pumping over twice daily to maximise color, tannin and flavor extraction. Cooling is used to ensure ferments remain in the 22-25°C range which will allow the wine to display maximum fruit expression. Pressing then occurs approximately 7 days after crushing and the resulting wine is put into French and American oak.